Sea Port of Sochi is the largest passenger port in the Black Sea. The building of the marine station can be considered as one of the landmarks of the city. Sea passenger port serves cruise passengers and owners of small boats. Short sea trips on various ships are offering here during the tourist season. Sea Port of Sochi is a member of the Association of Mediterranean Cruise Ports (MEDCRUISE) since 2002. Passenger port station has two passenger berths, ferry dock, parking for yachts. The building of the marine station is located on shore, in the central part of the city. This is one of the most recognizable and the most famous buildings on the beach in Sochi. Naval Station was built in 1955. There is a tower with a spire in the center of the building. The spire is made of polished stainless steel. The tower height is 71 meters. The tower is decorated with sculpted figures. In front of the Maritime Station is a fountain with a statue of the goddess of navigation. Marine Station of Sochi is an architectural monument of federal significance. The beach and promenade are also located next to the marina in Sochi. Paved pedestrian area is located between the marine station and train station. Joint Stock Company "Sochi sea trading port" is engaged in passengers and vessels servicing. 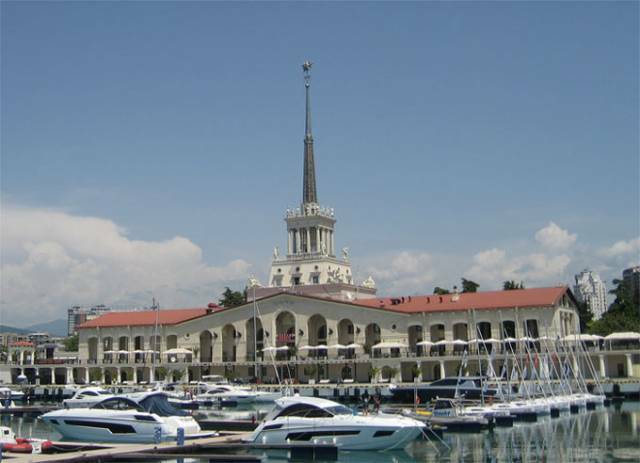 The photo depicts a passenger port station and the marina in Sochi. Location maritime station marked on the map of Sochi.